Nüwa is the ancient Chinese goddess known for holding up and restoring the sky to its place when the pillars supporting heaven were broken. She worked tirelessly to repair the damage (wrought by demons or battling gods—there are many differing versions! ), and to save humankind from the chaos of a falling sky, was said to have melted and reformed the four pillars. One thing it is said that she could not repair was the “tilt” of the sky—hence the sun, moon, and stars, were always moving toward the west. 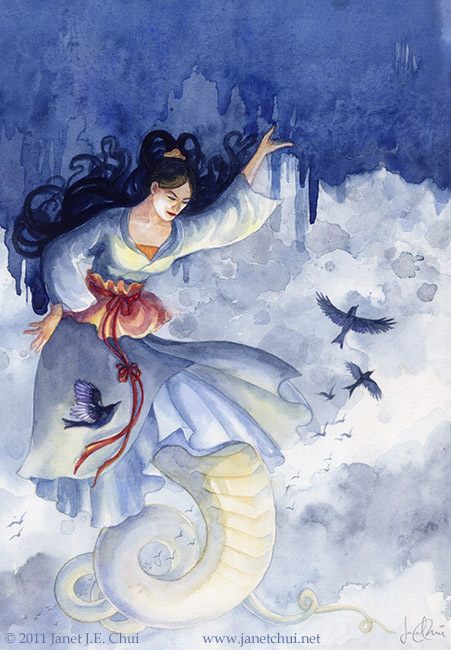 The story of Nüwa is one of the oldest Chinese stories, going back more than 2,000 years. I used a little artistic license to dress her in robes a little more recent than that.